How much bedding for your horse? 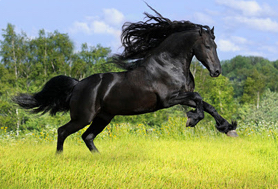 100 square feet (10 m2) will require 6 bags of premium horse bedding to start. Add 1 bag every 7-10 days to replace what’s been mucked-out of the stall. Replace all bedding every 10-12 weeks (see below for instructions). - and : it's affordable! For stalls measuring 3.5m x 3.5m (~130 sqft) a depth of 100mm (4”) is achieved using 10 15kg (33 Lb) compressed bags. The correct way to use this product is completely different to other products, especially saw dust. STEP 1. 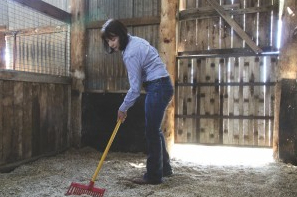 Clean-out stable as residual bedding will hinder benefits of hemp horse bedding. STEP 2. Spread HempBed evenly across the stable floor (shown here). STEP 3. Sprinkle 2 litres (1/2 gallon) water for every 10 bags of HempBed. This will activate the unique absorbency characteristics. STEP 4. Remove the moist clumps and manure daily by simply digging out the affected areas and replace with fresh Hemp bedding as required (approx. 1/2 bucket per day). DO NOT turn over or disturb the remainder of the stable bedding. Leave the unpolluted hemp bedding to do its job. You will appreciate having only to replace the small affected areas. Industrial Hemp Animal Bedding is produced from the soft core of the hemp plant stem and is the most absorbent bedding material on the market. This unique product features superior qualities to other bedding currently available such as wood or straw. Very High Absorbency allows the iHemp bedding material to stay dry longer than wood or straw shavings. HempBed will absorb 4x its own weight! Low Dust and Low Palatability are two qualities critical to limiting respiratory and other health risks to animals. 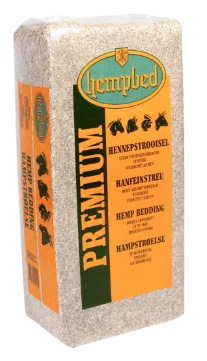 HempBed is chemical free and requires no pesticides or herbicides when grown which prevent chemical residues being transferred to any animals. HempBed lasts longer so is economical which translates into dollar savings thru reductions in labor, transport and storage.